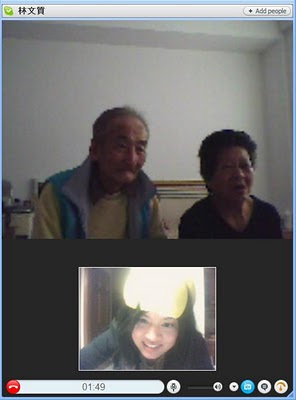 Yesterday, I skyped with my Grandpa and Grandma who live in Taiwan. My parents had bought one of those giant mesh socks of fruit only instead of some manageable fruit it was filled with four pomelo and I am pretty sure that tube of giant grapefruit as I like to think of them could have knocked someone out. So Mom, Dad, and I are cutting and peeling away at the pomelos and my dad crowned me with a pomelo hat. You can't really tell... From the picture it looks like some glowing orb or cheese wheel. We laughed, and it was so simple. I couldn't remember the last time the parents and I really laughed together. I couldn't remember the last time I was willing to be small, the little one in their household... So resentful I had become of being made the peacemaker, the clown, the mediator. Ah-Ma pointed and delightedly squealed "A pomelo hat! A pomelo hat! I used to make those as a little girl." Grandpa was uproarious... Then again, he always was with me. I hope I'm still laughing at awfully simple, ridiculously cheesy childish things when I'm as shrivelly and toothless as Ah-Gong... And still willing to learn new things, like how to skype. "... All our problems we send to the cross of Christ. All our difficulties we send to the cross of Christ. All the devil's works we send to the cross of Christ. All our hopes we set on the risen Christ ..."
After these blessings she called out, ""Is there anyone who has not eaten of the bread, who has not drunk from the cup of salvation?" This was not as I first heard, a call around the stadium to make sure that their massive organizational feat of distributing the elements to 17,000 had been inclusive. The liturgy continued to beg, "Is there anyone missing from the LORD's table?" And we began counting them together... The millions, billions of Chinese, Muslims, Indians, etc. And we recalled that feasts are communal: Even in my very personal gratitude for the breaking and pouring out of Christ, I gather with others who Christ singularly redeemed, and when we join as Church redeemed we are to remember and break and pour out for those still missing from the Table. We laughed together last night and amid that joy there was an extra pomelo and someone glaringly missing from the table. Josh is vacationing in Vegas... Had he been home, though, I suspect we would have been out somewhere together or hiding away in our rooms making our usual secret laughter or just too wise and sane and bitter to mingle with the charents. And so my prayer for the year ahead, is that I would do exactly as during the final hour of last year, yearning that those far away would share in the abundance at hand. May each table be a gathering of children, not presuming but assured, not deserving but invited. May each toast include absent friends and the absent far. May we draw to communion with joy that cannot be contained, cannot be hoarded. May joy--be it laughter, remembrance, gratitude, or any else--pass the truth test by its spilling over. thank you, e, for this post. it was great. i, too, enjoy pomelo hats.